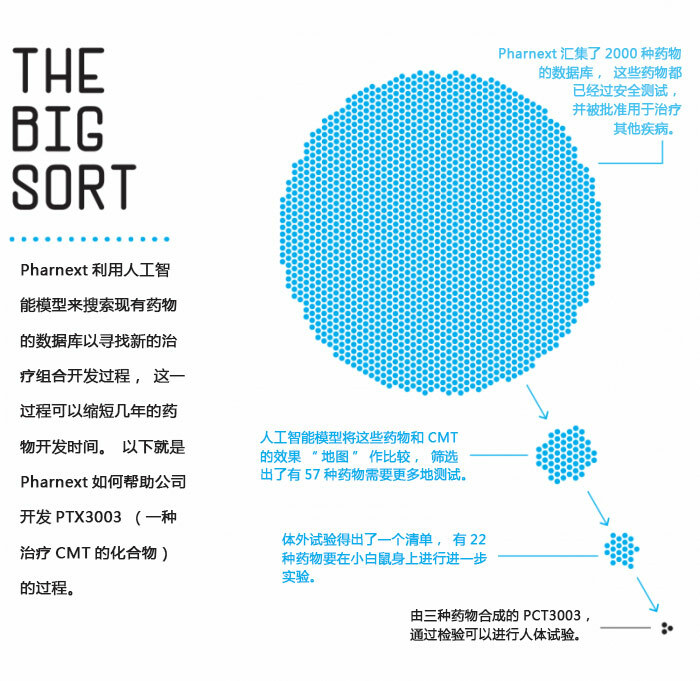 Running in the same race as Pharnext are companies ranging from giants like Google and IBM to startups such as Insilico Medicine, Recursion Pharmaceuticals, and BenevolentAI. All are deeply invested in the tools of A.I., using them to analyze millions of examples of drug and patient data and tease out patterns of significance. But Pharnext, founded in 2007, predates most of those competitors by several years—and has a longer head start when one factors in Cohen’s decades of earlier research in genomics and pleiotropy. And perhaps most important, Pharnext’s application of A.I. to medical problems over the course of more than a decade has finally reached a critical inflection point. In October, Pharnext reported positive results for a Phase III trial in humans of one of its drug combinations. The compound is PXT3003, a treatment for a neurodegenerative condition called Charcot-Marie-Tooth disease (CMT), a rare disorder for which no cure has been found. The primary cause of CMT is duplication of a single gene, but a whole cascade of bad things ensues “downstream” from that mutation. Schwann cells, which protect nerves, regress into stem cells that don’t do their job. Axons in the nerves begin to die off. Muscles can’t be controlled, and they shrink as a consequence. According to Pharnext, its Phase III results (which have not yet been peer-reviewed) showed CMT not merely stabilizing under PXT3003 but also being reversed, as cells began regenerating. Previous treatments, Cohen says, had managed only to slow patients’ decline. Under PXT3003, patients showed statistically significant improvement on two measures of disability. Based on those results, in February the U.S. Food and Drug Administration granted Pharnext “fast track” status for that therapy—an accelerated review process, awarded only when the agency thinks a drug demonstrates “superior effectiveness” in treating a serious disease. It is, to be sure, only one hopeful step against one rare ailment. Still, technology has shortened Pharnext’s path in ways with promising long-term implications, shaving years off the drug-design timeline. Preclinical testing and clinical trials generally take eight to 10 years, and developing a novel drug completely from scratch can add seven years to the process, sometimes much more. In the case of PXT3003, in contrast, A.I. helped Pharnext select three existing drugs to repurpose: baclofen, a muscle relaxant; naltrexone, used to treat opioid dependence; and sorbitol, a glucose reduction used as a laxative. Because the drugs were already in use, Pharnext could skip the Phase I trials normally required to ensure their safety—and eliminate the “build from scratch” stage. FDA fast-tracking increases the odds that PXT3003 could be on the market as soon as 2020—and it’s only one of Pharnext’s many projects. The company will soon begin a second Phase II trial of a drug with indications for Alzheimer’s and a first Phase II trial for an ALS therapy, in both cases using a similar repurposed combination. At the dawn of modern genetic research, almost no one anticipated the enormous complexity in the biology of disease. Many researchers thought the genome would be a kind of instruction manual for the body. Pioneers such as Celera Genomics’ Craig Venter and Francis Collins of the National Institutes of Health were celebrated as “gene hunters,” a term that evoked crusaders scouring the globe for that one “silver bullet” gene that would explain—and facilitate a cure for—a given disease. To some extent, these researchers found real treasure. Geneticist Nancy Wexler, for example, spent years in Venezuela compiling family trees of those affected by Huntington’s disease, a rare, inherited condition. Her work led to the discovery of the mutation in a single gene that predicts whether an individual will contract the condition. But scientists soon realized that genetic maps were less like an instruction manual and more like the parts catalog you get with Ikea furniture. What’s more, researchers discovered other catalogs that added complex variables to the relationships between genes and disease—for example, the proteome, the proteins encoded by DNA, and the transcriptome, all the nucleic acids that convert DNA into proteins. The morning-after disappointment has proved wrenching, as researchers learned that complex diseases, such as cancer and Alzheimer’s, didn’t yield to a single gene. (Even Huntington’s, its gene identified, has remained untreatable.) Today, Cohen and others see a link between the obsession with simplicity and a decline in drug discovery. That decline shows itself in the 1-in-10 success rate for FDA approval of new therapies; in spiraling costs for drug development (what a Tufts study recently identified as “the $2.6 billion pill”); and in the soaring prices of the few treatments that break new ground, such as the $475,000 cost of a course of treatment with Novartis’s leukemia drug Kymriah. 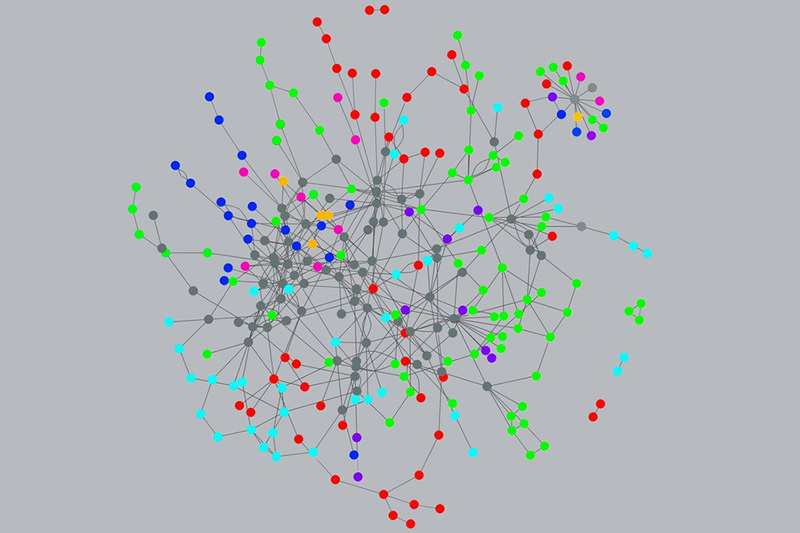 More recently, researchers have begun to grapple with biological complexity with the help of the science of networks. That science’s chief evangelist is Albert-László Barabási, a professor at Northeastern University whose 2014 book Linked popularized the notion that network theory can explain numerous fields, from fashion trends to sexual relations to disease. Barabási and others realized that disease is like a bad signal that moves through a network of connections from genes to proteins to cells to tissues, until all these “perturbations” manifest as the familiar symptoms of disease. Complicated diseases are confluences of numerous effects, because pleiotropy means that any given protein can act at different points in the body. Startups like Pharnext assume that drugs can also be pleiotropic, acting on more than one protein and more than one interaction in the body at the same time. To find a drug combination capable of tackling complexity, the enormous power of machine learning, with its ability to spot patterns in data, must be wedded to a sense of the structure by which disease operates. This, in turn, has required an evolution in the relationship between computer scientists and biologists. Newer machine-¬learning approaches ingest vastly more data and can assemble hierarchies of information that let them go beyond correlation. Still, harnessing these “deep learning” neural networks into a structure that has any predictive power requires some elegant algorithm-building. Colin Hill, CEO and founder of GNS Healthcare, is one of the builders. His company, based in Cambridge, Mass., has spent 18 years developing a computer system called REFS, which stands for “reverse engineering, forward simulation.” GNS has raised a total of $38 million over the years—from Amgen Ventures, the venture capital arm of the drug giant, along with Celgene and a variety of other investors—to build and fine-tune its models of disease. And in a recent series of trials, first published in 2017 in the medical journal The Lancet, GNS has detailed REFS’s potential when applied to a disease such as Parkinson’s—an ailment in which pleiotropic factors render existing treatments wildly hit-or-miss in their effectiveness. With Parkinson’s, the network of interactions set in motion by defective genes has a particular shape to it, and the breakdown of motor functioning is the most reliable indication of its progression. Feeding the genetic data of Parkinson’s sufferers and a control group into REFS helped GNS generate over 100 computer models depicting what might be going on as motor function deteriorates. The models can uncover previously unknown genetic mutations that may contribute to the speedup of deterioration. But that’s just the first part. GNS has used those findings to create 5,000 different computer simulations of randomized control trials, each aiming to predict how fast the disease would progress with varying approaches to treatment. Such speed-¬testing can be vastly more economical than seeking the same result through controlled human trials. And GNS, in partnership with other drugmakers, is now applying similar approaches to treatments for diabetes, ALS, multiple myeloma, and breast cancer, among other diseases. “We now have the ability to create and construct, on the computer, representations of human patients and their diseases such that we can now probe, drug by drug, care management intervention by care management intervention, and say what treatments work for which patient,” says Colin Hill, CEO of GNS. 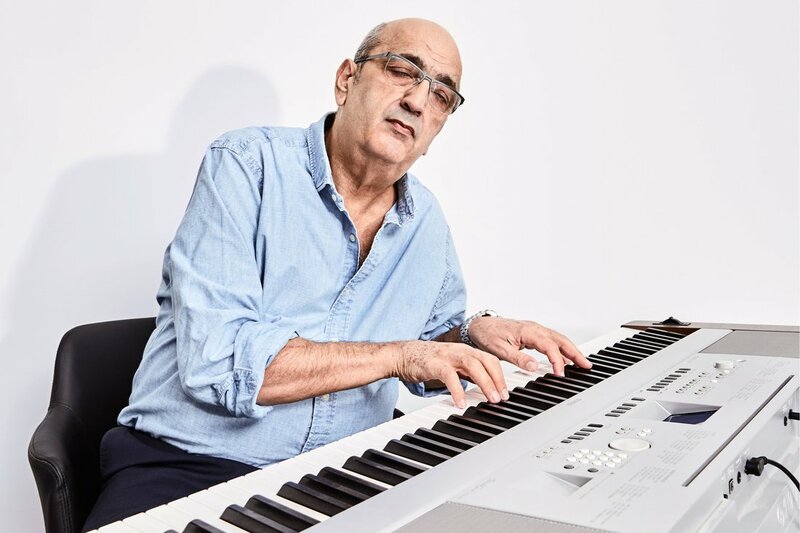 Daniel Cohen, now 67, spent his childhood in Tunisia’s heterogeneous society of Jews, Christians, Muslims, “living all together in a very elegant and pacific way.” He credits that experience for his taste for “things that are not complicated, but complex.” When he was 9, Cohen’s family immigrated to Paris, where he pursued the piano avidly. He switched to medicine once he realized he might have a greater impact as a scientist than a musician, but the passion has not left him. He has been a guest conductor at the Royal Philharmonic in London and dreams of leading that ensemble in Tchaikovsky’s Symphony Pathétique. “The predisposition to orchestra conductor, CEO, and scientist are all controlled by the same genes,” he jokes. Parlaying genomics and technology into pharmaceutical success is something Cohen has done before. He was a cofounder of Millennium Pharmaceuticals, a U.S. oncology-drug maker that helped develop the multiple-myeloma treatment Velcade. Cohen is bullish that Pharnext can be successful with A.I., but he is also aware of the technology’s limitations. Google’s ¬AlphaZero, an A.I. program, was able to beat the world’s human masters at the Chinese strategy game Go, without using any prior human knowledge. But as Cohen points out, Go has a finite set of rules, which AlphaZero knew completely. In biology, thanks in part to pleiotropy, the rules are not fully known—and may never be. But thoughtfully designed A.I. has enabled Pharnext to build models around the rules that are known and make choices accordingly. Out of the universe of 10,000 known drugs, the company’s discovery model takes in an assortment of 2,000 that are both out of patent and “marketed”—that is, already judged both therapeutically effective and safe enough to be sold to the public. To develop its CMT drug, Pharnext first spent about a year assembling its network model for the disease—a framework comparable to GNS’s Parkinson’s map, showing how nervous and muscular problems “cascade” from the relevant gene mutation. Based on this mechanism, the computer model arrived at a short list of 57 candidate drugs that addressed various points in the cascade. Pharnext tested those drugs one by one in vitro, generating a shorter list of 22 to be tested in mice, which finally yielded the three-drug combination that went to human clinical trials. The recent positive Phase III results confirmed that the PXT3003 cocktail is acting at various points in the cascade. Without the A.I. model, many more years of preclinical testing would have been required beyond the three years it took Pharnext, says Cohen. 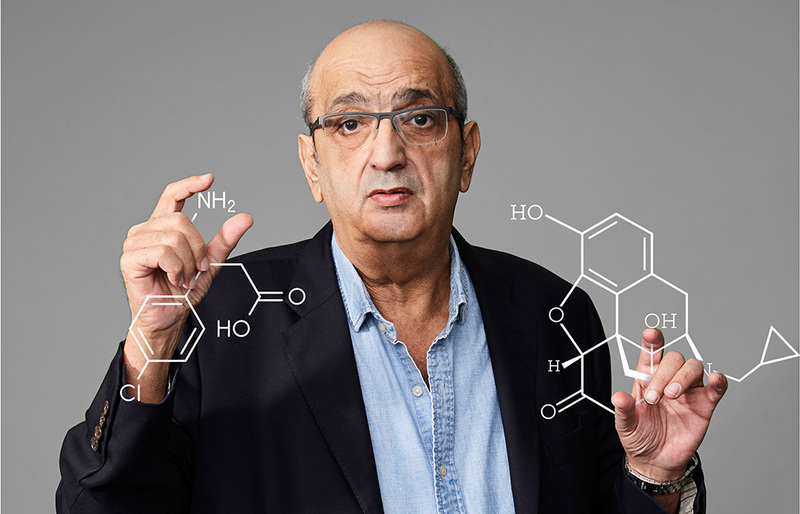 “With 2,000 drugs [to start with], I could produce all possible combinations, a billion possibilities” to test in vitro. That’s a recipe for countless false positives and dead ends—years of frustration, for now forestalled. Beyond possible victories for investors, the advances at Pharnext and GNS point the way to A.I.’s growing up—and pharmacology along with it. The ability to reason about causality, and to explore counterfactual questions, is a threshold that users of artificial intelligence have long sought to cross. The computer models at these startups are making a foray in that direction as they manage and tame a bewildering number of variables. Even the underlying definition of disease may evolve. As scientists are learning, these definitions have been overly simplistic. A study in the journal Bioinformatics last year noted that attempts to treat tumors are hampered by the fact that genetic mutations in cancer are “fundamentally heterogeneous”: What appears as one disease, or class of disease, in fact contains few commonalities and many differences from patient to patient. As it becomes clear that what’s happening in any body differs sharply from the “on/off” model of one gene turning on a set of symptoms, technology can help drug developers wrestle with the complexity.